Whittier High School senior Ava Sanchez is determined to make a difference – whether its empowering her peers to give back to the local community or inspiring younger students to achieve academic success. Recognized for her leadership skills, integrity and work ethic, Sanchez – a straight-A student who is on track to be one of Whittier High’s class of 2019 valedictorians – has found a way to balance academics with community service. Going into her senior year, Sanchez has already passed six Advanced Placement exams, including AP macroeconomics, which she took through independent study. As a three-year member of the Academic Decathlon team, Sanchez has earned medals in essay and speech. Sanchez’s advocacy began at an early age, when she started an anti-bullying club, Ambassadors of Peace, at Andrews Elementary School. Sanchez eventually became Andrews’ Associated Student Body president, a position she also held at Edwards Middle School, where she still volunteers tutoring students in math and science and acting as consultant for the school’s ASB. 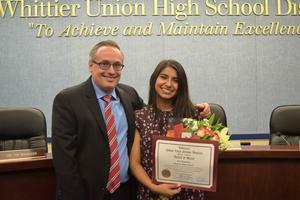 Sanchez first gained attention as a sophomore, when she made a presentation at a high school readiness assembly at East Whittier Middle School. Sanchez’s poise and confidence as she addressed the students greatly impressed administrators. As Whittier High’s 2018-19 ASB President, Sanchez has made it a priority for the group to be a true service organization that extends into the Whittier community. Under Sanchez’s leadership, ASB students recently participated in an event for the Whittier Assistance League, coordinating logistics to ensure a positive outcome. While Sanchez has had a successful high school career, it has not been without challenges. But it is her incredible grace and courage during these rough patches that has brought great admiration from Whittier High Principal Timothy Liggett. Sanchez’s credits her family for instilling her with confidence.